Stop Selling! Start Solving! Larry Kendall transforms the way readers think about selling. He points out the problems with traditional selling methods and instead offers a science-based selling system that gives predictable results regardless of personality type. This book teaches readers how to shift their approach from chasing clients to attracting clients. Readers will learn how to stop selling and start solving by asking the right questions and listening to their clients. This is an invaluable step-by-step guide that shows readers how to be more effective in their sales careers and increase their income-per-hour, so that they can lead full lives. 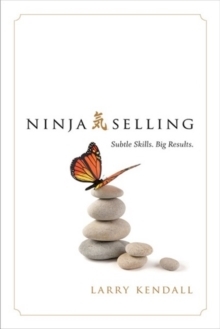 Ninja Selling is both a sales platform and a path to personal mastery and life purpose. Followers of the Ninja Selling system say it not only improved their business and their client relationships; it also improved the quality of their lives.